An eager Patrick Kenefick ran up the stairs to the second floor seating area at the Ellenton Ice Rink, in Manatee County, and only to apologize for being a mere two minutes late for his interview. The clean shaven seventeen-year old had just been dismissed from Cardinal Mooney Catholic High School, and welcomed his interviewee with both a firm handshake and appreciation. Kenefick, has enjoyed his past four years at Cardinal Mooney and has taken his education to whole another level over the past two years. “I’m taking four AP (Advanced Placement) classes this year,” said Kenefick. What’s even more impressive is the variety of those four classes, and that it’s more than half of his classes in total (seven). “(I’m taking) Human Geography, AP Literature, AP Calculus and then AP U.S. Government and Politics,” said an attentive Kenefick. In addition to his studious attributes mentioned above, Kenefick is also involved with a couple of different clubs at Cardinal Mooney. The senior had almost forgotten to mention his favorite club that he partakes in. After High School, Kenefick plans on potentially joining the United States Air Force Academy or the Naval Academy. Additionally, he is considering other potential Universities in Florida; where he’ll continue to play College Club Hockey as well. So, one could sense the youngster’s competitive nature, plus persistency to grow and not just as an individual, but as a member of a team. 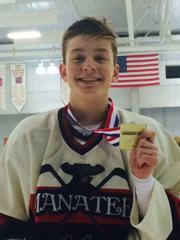 As most may already know, this bright student is also the captain of the LHSHL’s East Manatee Admirals. East Manatee’s Head Coach, Eric Wessel, has had the opportunity to coach Kenefick for over two seasons and has watched his new captain develop into both the leader and person that he is today. “Patrick has always been a good hockey player, and he has grown more as a person over the last three years,” said Wessel. As for the Admirals’ captain, he’s taken much pride in being a part of his High School Hockey team. Coach Wessel even recalled a time when the five-foot-ten forward stood up in the locker room and addressed his team and during a spring game. Not bad for a skater who’s been playing hockey since he was three, and has only been named captain on one other occasion while playing the sport, right? And, the 200-pound skater chose High School Hockey over travel this season, too. “I’ve left travel hockey, so that I can play High School Hockey this year, because I missed it that much,” said the Admirals captain after he took last season off from the LHSHL. While Kenefick no longer plays travel ice hockey, he still has good ties with his former teammates and coaches from his “AA” Gulf Coast Flames playing days. “Patrick was always one of the hardest working players that I know,” said Coach Fred Eaton of the Gulf Coast Flames. Additionally, Kenefick picks up another type of stick for an additional High School sport, which would be Varsity Lacrosse at Cardinal Mooney. The multi-sport athlete also credited how his experiences from playing ice hockey have helped him progress on the lacrosse field, too. “I picked up a lacrosse stick for the first time my freshman year, and I was awful,” joked Kenefick. Cardinal Mooney’s Head Coach of lacrosse, Derek Wagner, even commented on Kenefick’s progression between the white lines. “Patrick has matured as a player, student and leader immensely,” said Wagner. “He takes on tasks without hesitation and commands people to follow his lead with confidence. He is an extremely strong player who always pushes himself and teammates to go further,” added Kenefick’s lacrosse coach. Wagner didn’t stop there, either. He made an interesting point about Kenefick’s determination and work ethic both on and off of the field. “On the field he is a blue collared hard worker. And then off the field, he’s a white collared sophisticated student. His unique ability to excel at both traits makes him a very special student athlete,” said Wagner. However which way one wants to characterize East Manatee’s captain, it’s apparent his uncanny ability to grow as a member with numerous programs is exclusive; whether that’s in the classroom, during a debate or picking up the stick to take to the ice or lacrosse field. Yet, most importantly he envies his teammates.